DHI is an association proudly serving door security and safety professionals, and the dynamic companies they represent, in the non-residential construction industry. Through education, advocacy, accreditation and facilitated networking, DHI provides members with the collective intelligence to meet the security and safety needs of their customers. The International Door Association's primary mission is to provide programs and services to door and access system dealers, for the express purpose of enhancing their value and professionalism. IDA plays an important role in the process of quality creation and control by providing helpful programs and services to those who sell, install, and service the superb products produced by the door industry's exhaustive list of manufacturers. NFIB is America's leading small business association, promoting and protecting the right of members to own, operate, and grow their businesses. The Chamber of Commerce for Greater Montgomery County, formerly known as the PennSuburban Chamber, is the premier business organization for networking, learning and giving in the county. The mission of the Chamber is to enhance the economic health of the business community and facilitate opportunities for all members through connections, events and education. With more than two million verified pro reviews and one of the industry's most comprehensive screening processes, HomeAdvisor gives you the peace of mind that comes from knowing you hired a pro you can trust. 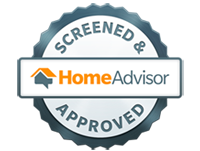 Allen Door & Service Corporation is proud to be a screened and approved member of HomeAdvisor.